In this video, you will learn how to automatically and manually create object relational hierarchies in RadGridView for WinForms. Create and define a columns schema for the presented data at the first level of the hierarchy. 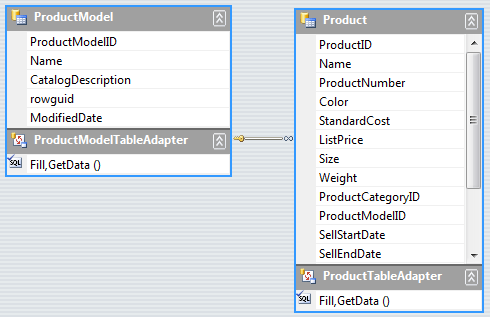 Create and define a columns schema for the presented data at the child GridViewTemplate. Create and associate a GridViewEventDataProvider with the child GridViewTemplate. Handle the RowSourceNeeded event to populate the data for each parent row. Calling the the BestFitColumns method may cause the grid to load all the data explicitly. Call this method with the for the visual cells only. You should make sure that there is a relation between the tables in the dataset. In the bellow example the relation name is "ProductModel_Product" and the relation is between the ProductModelID field in both tables. This new event based hierarchy mode can be used in different lazy loading scenarios including ORM frameworks, WCF services or complex business objects.